Doug Crank works at National Fruit Product Co. in Winchester. At 23, Doug Crank was making decent money working in construction — until the housing market bottomed out. What a difference five years makes. 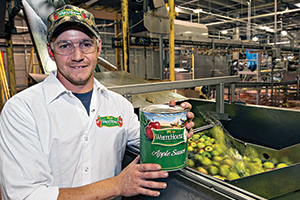 Now 28 and with a growing family to support, Crank is a maintenance supervisor on the fast track at National Fruit Product Co. in Winchester, best known for its White House brand of applesauce and specialty food items. Crank’s job entails using advanced technologies to keep production lines running smoothly. He moved into the role earlier this year — his third promotion since joining the company in 2008. “It definitely feels good to have a stable, good-paying career in front of me,” Crank says. Virginia needs more Doug Cranks. Despite paying an above-average wage, Virginia manufacturers face a looming crisis, with nearly one-third of their workforce nearing retirement. “Our manufacturers need people with middle skills: more than a high school diploma, but not necessarily a college degree,” says Katherine DeRosear, director of workforce development of the Virginia Manufacturers Association. The Richmond-based trade group has launched the Dream It, Do It Virginia initiative, geared mainly to people between the ages of 18 and 24. (Crank is even featured in a VMA recruiting video extolling the virtues of a manufacturing career.) Another VMA initiative, known as Military2Manufacturing, targets the large number of exiting service personnel at Virginia’s numerous military installations.